The Stephen Memorial Book Award – for books with distinctive cats! 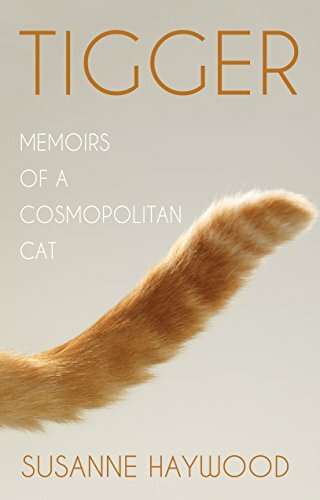 Tigger’s memoirs tell of a cat who lived on three continents, encountered everything from squirrels to kangaroos, and made the most of every minute. Tigger’s memoir begins when he is only a few months old and adopts the family who he will be looking after, as he sees it. Whether he is grudgingly accepting new arrivals, cats and even dogs, or being put into a carrier to travel abroad, Tigger is the one constant in the book always for the family who need his guidance and sometimes his correction. Tigger is well-travelled and his travelogue of his time away from the family as he moves across several continents only highlights his steadfast nature in dealing with others – and his ability to run quarantine staff ragged! Coming across a wide variety of creatures, from those he should avoid like kangaroos and snakes to the those he tolerates like horses, and even those he hunts, he still finds time to make sure the other family pets know their place and that it is firmly under his paw! A cat of no little character, Tigger’s pawprints show clearly on every page and we’d like to thank Susanne Haywood for sharing her memories of him with us. Thank you so much for this very precious award, which will have a place of honour on my study wall and inspire me to keep writing. Rest in peace, Stephen and Tigger, two distinctive feline spirits!